The Shakespearean character Polonius in Hamlet once remarked, "To thine own self be true." Four hundred years later, a tragic story unfolded on the world scene, with Ken Lay, in the lead role. It played out like a Shakespearean tragedy and is a timely reflection on being true to self, for all humanity to take heed. 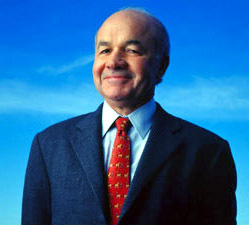 Kenneth Lay believed he was a good righteous person who did the best he could for his family, friends and the business he governed. His father was a minister, so he grew up in a religious, moral environment. He progressed from a humble background, fashioning his own way in the business world, ending up as the founder and CEO of the now bankrupt Enron. In mid May, he was found guilty on all accounts of fraud. When he came out of the court room he declared his shock and dismay at the verdict. In his mind he could not accept how he had done any wrongdoing. In his belief system, he felt that he was a victim of circumstances and innocent as charged. In a way he is correct, he was a victim of circumstances, however, the circumstances were of his own egotistical making. Therefore he was correct to declare innocence, for it was the image he had built up in his mind, that made him do all the erroneous actions that brought about his demise. Right up to the end, he never realized he was a victim of his minds dominance over his heart and everything he held dear to his intrinsic values of life. He was faithful to his fallacious ego, but treacherous to his valid hearts contentment. This is a sad tale to reveal, nevertheless, it is a warning to every CEO and business person in America. Indeed it should be an alarm bell that is going off in every persons mind. They need to ask themselves if their egos' are telling them to do things their heart does not agree with.
' Is the need for greed more significant to them, than the importance of their personal health and the well-being of other human beings?
' Are they slaves to their egos, so much so, that they can no longer locate the difference between expert opinions(which are just opinions) and the truth of each point in their lives that requires trustworthy, affirmative actions?
' Do they consume foods and drinks that may upset the biological chemical balance of their mind and body?
' Can their lifestyle affect their decision making?
' Does their belief system help or hinder their true enjoyment of life?
' Do they feel stress and try to mask it with medication and advice that does not solve the cause of their distress.
' Can a person define who it is in their mind that is making their decisions for them? If Ken Lay could have answered these questions in an authentic manner, no doubt he would be alive today and running one of the most successful corporations in America. He was inflicted with a disease of the mind that eventually effected his heart. It led to his early death at the age of sixty-four. It is tragic how it all played out. Alas, he was totally unaware that the invisible disease in his mind, that has no medical definition, brought about the physical disease in his heart. Unfortunately, to some extent, the same scenario will play out in millions of American lives and many people will meet their demise far to early, long before their shelf life was due to expire. The minds illusions within their belief system will cause cancer, heart attacks and all other ailments that come from erroneous thinking. A strong ego may believe their business appointments diary is very important, however, it is no match for the truths that make the heart tick on time. Lay fooled the investors in Enron for a while, he fooled most the employees in Enron for a while...But most of all, he fooled himself most of his life in Enron, into thinking he was true to himself. In the end his heart had to break the news, in a terminal, dramatic manner, how unsound and mistaken he lived out his final years on earth. So I will leave it up to Shakespeare himself to have the final words. Farewell; my blessing season this in thee!"